A solar-powered pumpi s apumprunning on electricity generated byphotovoltaic panels or the radiated thermal energy available from collected sunlight as opposed to grid electricity or diesel run water pumps.The operation of solar powered pumps is more economical mainly due to the lower operation and maintenance costs and has less environmental impact than pumps powered by aninternal combustion engine(ICE). Solar pumps are useful where grid electricity is unavailable and alternative sources (in particular wind) do not provide sufficient energy. Solar water pumps can supply water to locations which are beyond the reach of power lines. Commonly, such places relie on human or animal power or on diesel engines for their water supply (Omer, 2001). Solar water pumps can replace the current pump systems and result in both socio-economic benefits as well as climate related benefits. 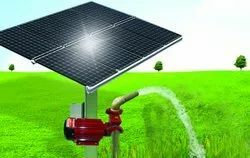 The water supplied by the solar water pump can be used to irrigate crops, water livestock or provide potable drinking water. A solar water pump system is essentially an electrical pump system in which the electricity is provided by one or several PhotoVoltaic (PV) panels. A typical solar powered pumping system consists of a solar panel array that powers an electric motor, which in turn powers a bore or surface pump. The water is often pumped from the ground or stream into a storage tank that provides a gravity feed, so energy storage is not needed for these systems.